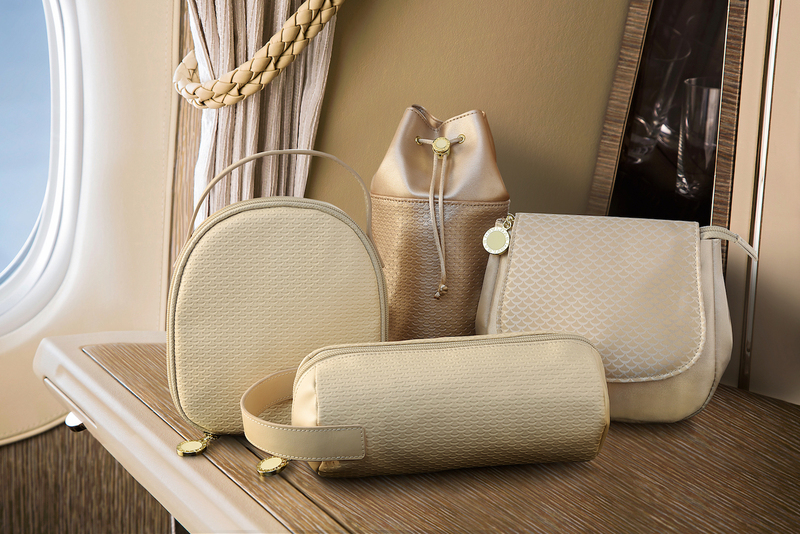 Like a little bit of a small spa retreat in the skies, the First Class amenity kit provides travellers with all the essentials they may need in flight and upon landing. Think, an eye mask for better beauty sleep, some perfume for post-arrival hugs, and a hair brush to tame that static airplane mane. And whilst a standard brush or perfume may somewhat do, the First Class experience is never about things that will simply ‘just do’. Airlines have been quick to respond to this, battling it out with one another by featuring only the best brands in their specially curated sets. 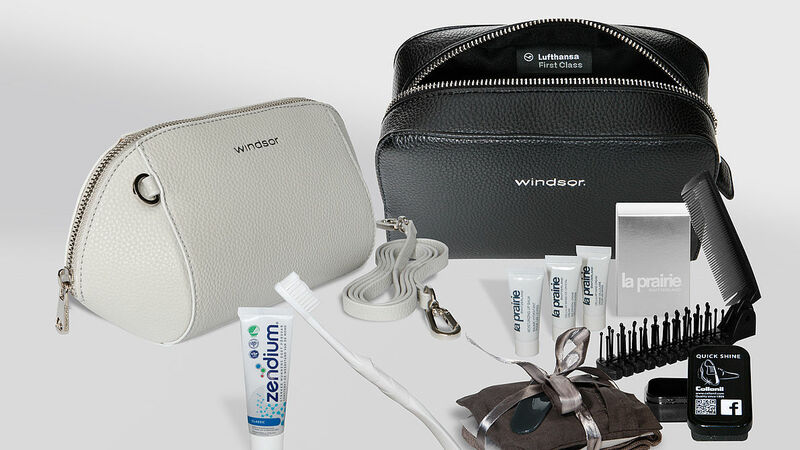 After all, beyond the in-flight chef grilling your sirloin to perfection before your eyes, and after your designer-pyjama-nap in a full-on flat-out double bed, it is the amenity kit that stays with you long after you’ve stepped out of seat 1A and onto the tarmac of your destination. The amenity kit becomes a token of your journey, be it for better or for worse. 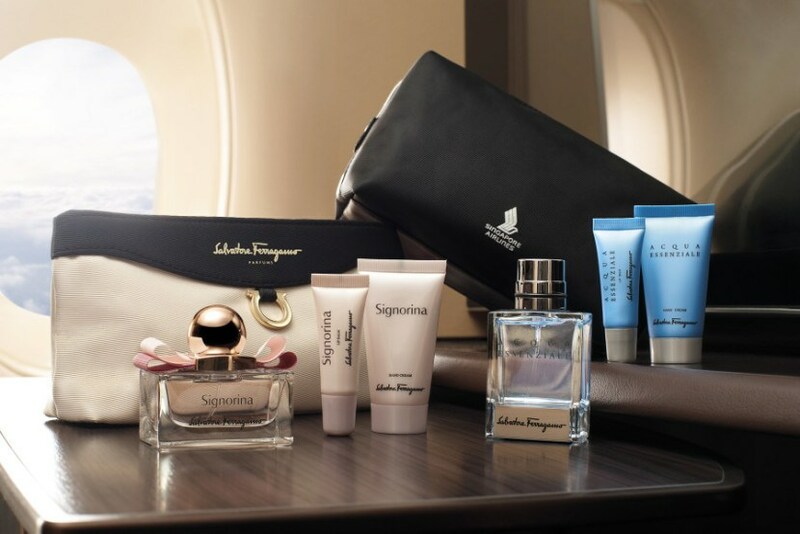 From Givenchy sleep masks to Ferragamo perfume and a miniature RIMOWA suitcase, we’ve put together a list of some of the best first class amenity kits in the skies at the moment. Whether you’re a beauty aficionado or simply a frequent flier on a mission, here’s a hint of the little pampering goodness you can expect onboard. Snagging the title of the world’s best airline many years in a row and by many agencies, it comes as no surprise that Qatar Airways’ first class amenity set does not disappoint. Designed in collaboration with Italian luxury luggage brand BRIC’s, the charming kits resemble miniature versions of the brand’s Bellagio and Sintesis suitcase, featuring an actual hard-shell casing with a Tuscan leather trim. Olive oil company Castello Monte Vibiano provides the beauty products on its inside, including a facial mist and night recovery cream. Most notably, all travellers will also receive a BRIC’s signature luggage tag, a very apt accessory for the frequent flier. It’s easy to be wooed by the luxuriously soft bedding inside a Singapore Airlines First Class cabin, even more so when the sleeper suit the airline provides is designed by French fashion house Givenchy, with matching suede slippers to suit. When you do decide to slip down your eye mask for a quick pampering sesh, the suave amenity kit features an array of toiletries by Salvatore Ferragamo. For the ladies, this includes Signorina products and perfume, whilst the Acqua Essenziale line is available for men. Dubai’s national carrier Emirates has long been a front liner in the world of luxury travel, and its incredibly well-stocked first class kit is no exception to this. The faux leather amenities kit is stocked with skincare essentials and perfume from Bvlgari, and is available in 8 different designs. What’s more, Emirates has also collaborated with BYREDO skincare to bring travellers an exclusive ‘wellness kit’, featuring chamomile facial toner, roll-on sleep oil, and pillow mist spray for the ultimate sky-high relaxation. Aiming to bring a spa-like experience to the skies, Delta has collaborated with two top brands in their respective fields to bring travellers a set they won’t so easily forget. The amenity kit is designed by TUMI, with an exclusive complimentary monogramming of the bag by any TUMI retail store on land. Stocked with beauty essentials by Khiel’s, the kit includes everything from a grapefruit-scented hand cream to aloe vera and oatmeal body lotion, and the famous Kiehl’s Lip Balm #1. 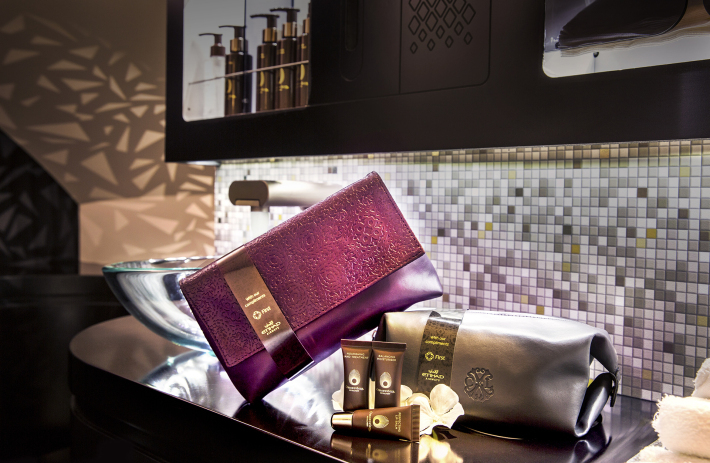 Designed by Christian Lacroix, Etihad’s first class amenity bags are not just stylish to look at, but stocked with soothing goodness, too. The skincare products tucked in the purple and grey kits are from Hungarian luxury skincare brand Omorovicza, and have been developed in a Nobel prize winning laboratory. Beyond the common finds, these include a lip balm, a gel-cream face moisturser, and a nourishing hand treatment. Always wanted to get a RIMOWA suitcase but never quite got down to it? 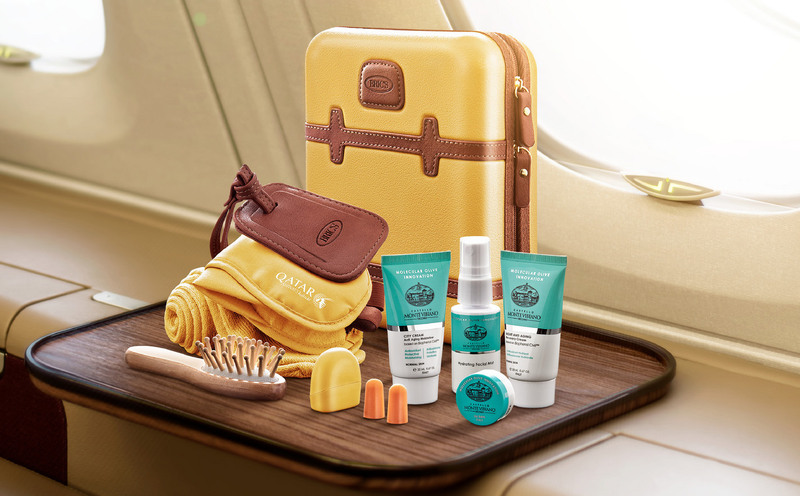 Then you’re in luck when you fly EVA Air’s Royal Laurel Class, which offers an exclusive amenity kit designed by the trendy luxury suitcase label. Teaming up with Georg Jensen, the two-piece design features enough space for both passport and travel accessory storage, as well as an eyeglass cleaning cloth, and dental hygiene set. As for skincare, this is provided by French cosmetics brand Clarins. Here’s one that will excite all fans of cult Australian skincare brand Aesop. Designing both the case and stocking its interiors, the label has collaborated with Cathay Pacific to bring First Class travellers a stackable camel-coloured or grey amenity case. Beyond a dental kit, this includes signature Aesop products including a beautifully scented moisturiser and nourishing lip balm. Perfect to top up on that hydration during those often drying flight hours. 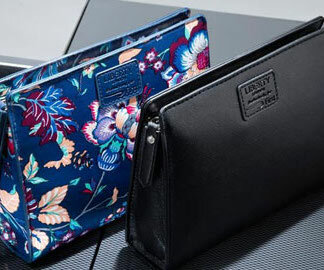 Paying beautiful tribute to its home in London, British Airways designed its delicate amenity kits in collaboration with the quintessentially English Liberty London department store. Featuring a dark ‘arundel’ pattern for men, and a rich blue vintage flower ‘indiana’ pattern for ladies, the bags are stocked with beauty essentials from Aromatherapy Associates, and make for a precious vanity kit both onboard the flight and beyond. Japan Airlines has long been popular with its fans for its more uncommon and creatively exciting extras. 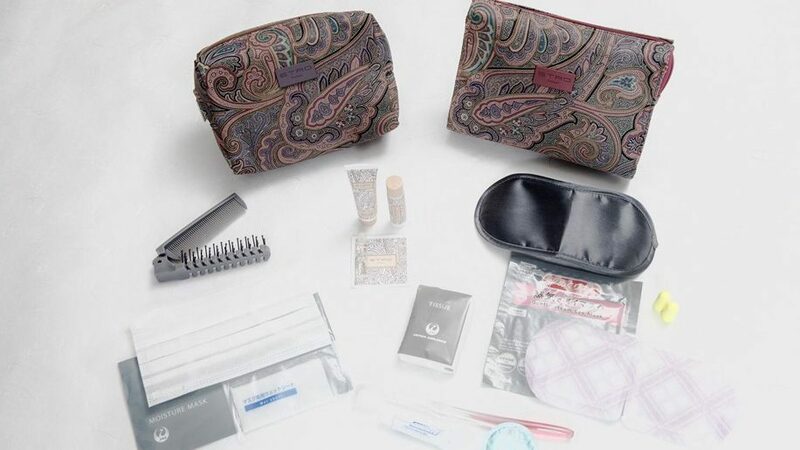 Collaborating with Italian luxury fashion brand ETRO, the eye-catching paisley jacquard fabric amenity sets feature a dental kit, moisturiser, lip balm, and perfume. Yet beyond the common suspects, the set also includes a moisturising sheet mask (which frequent travellers will know are the in-flight trend of the minute), as well as a steam eye mask on flights heading to Japan. 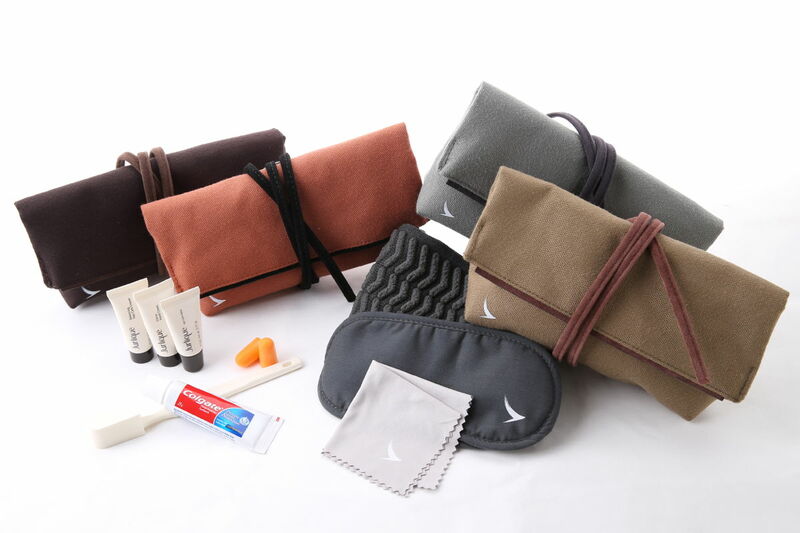 Lufthansa’s latest amenity kit gained much praise from the international airline community, as the German airline uses sustainable materials in its new high quality and high durability amenity kit. With both a modern classic and highly functional look, the bag comes with a detachable strap, making it easy and stylish to use even outside of the airplane. 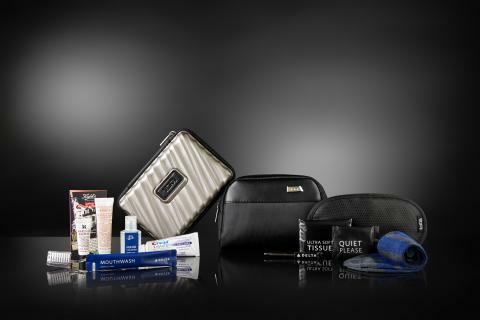 The contents include the usual suspects, with a series of exclusive products from La Prairie.